Brighton head to Burnley looking for a third successive Premier League win on Saturday. 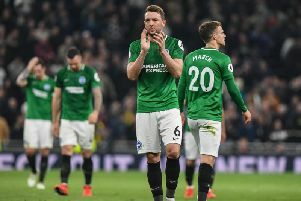 After a 2-1 victory at Huddersfield last weekend, Albion beat arch rivals Crystal Palace 3-1 on Tuesday evening despite playing with ten men for more than an hour. After finishing seventh last season, Burnley have struggled so far this season and are second from bottom after 15 games following a 3-1 defeat at home to Liverpool on Wednesday. What time does Burnley v Brighton kick off? Kick-off at Turf Moor is 3pm, it's the third successive 3pm Saturday kick-off for the Seagulls. The sides drew both Premier League games 0-0 last season. No. Albion's next televised match is the game with Arsenal on Boxing Day. Shane Duffy will serve the first game of a three-match ban after his sending-off against Crystal Palace on Tuesday. Albion will also have to check on the fitness of striker Glenn Murray and winger Jose Izquierdo, who went off injured against Palace, and club captain Bruno, who missed the game. Dale Stephens is back available after serving a three-game suspension for his red card at Cardiff last month. Albion will also hope winger Alireza Jahanbakhsh is fit to return to the squad after missing the last four matches. Burnley's James Tarkowski, who returned after hernia surgery as an unused substitute on Saturday, was back in the starting line-up for Wednesday's match with Liverpool. Former Albion players Ashley Barnes, Sam Vokes and Chris Wood could all feature against the Seagulls. Martin Atkinson is the man in the middle at Turf Moor. He has shown 41 yellow cards and one red card in 12 Premier League matches this season. The assistant referees are Constantine Hatzidakis and Daniel Cook, with Rob Jones the fourth official. Brighton are the favourites to beat an out-of-form Burnley side on PaddyPower. The Seagulls are 6/4 to win, with Burnley 15/8 and the draw 2/1. A repeat of last season's 0-0 result is 11/2. Both Albion and the Clarets are priced at 6/1 to win 1-0. Brighton striker Glenn Murray is 9/2 to score first, with team-mate Florin Andone 11/2. Burnley forward Chris Wood is 6/1 to notch the opener, with Sam Vokes 13/2 and former Brighton striker Ashley Barnes 15/2. Albion centre-backs Shane Duffy and Lewis Dunk are both 25/1 to score first. Murray is 6/4 to net anytime, with Andone 15/8, Wood and Vokes both 12/5 and Barnes 11/4.